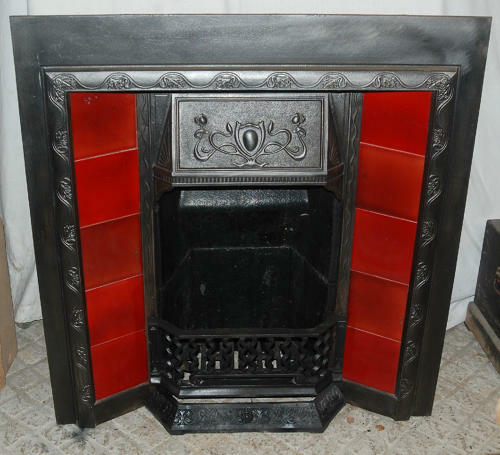 A very pretty, cast iron Art Nouveau fire insert with red tiles. The fire has an attractive motif to the canopy style smoke hood, typical of the era, and decorative leaf border framing the tiles. The fire has five bright red tiles on either side of the fire opening. The insert has an RD number, RD 457963, dating the fire to 1900-1909. The fire has original frontbars, with a pretty serpentine design and decorative ashpan cover. The insert comes with a concrete fireback and fire stool. The antique fire does have some slight signs of wear due to age. The tiles have some small areas of chipped paint, scratches and the enamel has cracking and crazing. The colour is bright however and there are no breaks. There are some chips and marks to the concrete back. The left hand side (when facing the fire) has a scratch to the outer edge and there are some casting marks and signs of use to the fire and the ashpan cover. There are some small knocks to the frontbars. The back has surface rust as expected. The fire is a very pretty, antique item, and a beautiful example of Art Nouveau style. A lovely item for the bedroom or smaller reception room.